What’s the best religion in the world? For me Buddhism is the best world religion! Do you agree? Share your thoughts on this post about what the best world religion is. I’m sticking to the world religions, for the sake of brevity, but have included an up and coming contender: the Bahai. Aside from that, these are the world religions (by alphabetical order): Buddhism, Christianity, Judaism, Islam, Hinduism, Sikhism. So what do you think? I’ll be helping you make your case by sharing the basics on each of the world religions. The main criteria I’ll follow are: peaceful actions by their followers and the quality of the teachings. I’ll let you weigh in on the matter every step of the way. I’ve included the most eloquent responses (whether I agree with them or not) people made on a previous version of this page. Violence in the world religions? I took a class on religious violence a few years back, and Terror in the Mind of God: The Global Rise of Religious Violence is the book that was prescribed reading. My professor felt it was a decent introduction to the topic, except that the chapter on Buddhism wasn’t really about Buddhism. The religions explored don’t quite fit my list. They are: Christianity, Judaism, Islam, Hinduism, Sikhism and Buddhism. On that list Hinduism and Buddhism are bumped into one, in the discussion of the Tokyo subway incident. The sect responsible for that attack was however hardly Buddhist OR Hindu by the usual standards. Buddhism is an unusual religion by Western standards. It adapts to whatever culture it finds itself in and morphs into something new. For instance Buddhism in the West is far less ritualistic than Buddhism in Asia. A religion that is so hard to catch is also hard to blame for violence. It is probably fair to say that no religions have been fought over Buddha. But it is at the same time true that Buddhist philosophy can be interpreted to in some cases defend violence. Human beings what they are, they will find a defense for violence anywhere. In the case of Buddhism it’s the doctrine of Sunyata that lends itself best to violence: if everything is temporary anyhow, where is the crime in killing? Another frequent way to get from Buddhism to violence is the defense of the dharma (doctrine) itself. Violence against Tamils in Sri Lanka has been defended that way. In present day Burma non Buddhists have a hard time getting and keeping serious jobs. This sort of thing is of course not unique to Buddhism, but it does go to show that in practice Buddhists can be just as partial to their own as any other religious group. Which is just part of the very serious situation in Burma where human rights are not recognized at all. What is the Best world religion? 5% No religion or something else. 15026 people voted in this poll. Buddhism is the best religion in the world! Buddha teaches us on compassion, loving kindness and meditation. Look at the surrounding and you will notice everything is recycled ( our lives are going round the samsara wheel) we breath in oxygen and the plants take in carbon dioxide and give out oxygen. We drink water and pass out urine, evaporated and comes back as rain ultimately water. Our wastes and bodies go back to the soil and fertilize the soil for vegetables and plant to grow and becomes our foods. The cycle goes round and round, we die and birth comes. Buddha has explained the existence of the 31 plane of existence, hell beings, ghosts, lower realm spirit, human beings, earth bound spirits to god realm, heavenly being, enlightened beings, bharma , bodhisattva, arahan, Buddha – No religion in this world can explain in such details and understanding. One thing that I like about Buddhism is that it does not make any claims about being the “best religion in the world”. Do you think there is any inconsistency with picking Buddhism as the “best religion in the world”? I personally think that it is not constructive to pick a “best religion”, I think this is an unhealthy way of thinking and I would encourage people to shy away from thinking like this and instead focus on discussing specific things about different religions that they like or agree with, and other aspects that they dislike or disagree with. Christianity is the best religion in the world! Christianity, although it’s not really a religion, it is a way of life. All other religions are about man reaching out to God, but Christianity is the only one where God is reaching out to man. God is a holy and just God.Man can’t be good enough for God that’s why He came in the form of a human -Jesus Christ. His sacrifice is the only way we can go to heaven. Jesus is the way, the truth, and the life. No one comes to the Father God except by Jesus. As Christian by fact and not by faith and as protective of my culture, I’d say Christianity is the best religion in the world as I’m not that arrogant to pretend it’s the best in the Universe as some do. However, I don’t believe or at least, I’m not sure God would exist as whenever if he did, there wouldn’t be as many wars, violence nor he would allow people to kill in his name; whatever name he has. If such a subject wasn’t that hot and wouldn’t make me to protect my own culture and religion, I’d say that no religion is the best, the best religion is what you do with it, the way you understand it, the way you act in its name. Therefore, the best you do, the more positive and the more love you bring, the less violence, and the more you protect life and individual freedom, the best you do of your religion. Hinduism is the best religion on earth! I think you should not have to raise this question of best religion, because there is only one true and pure religion. It has existed from the beginning of this universe and that is Hindu religion. Except this all religions came into existence because of this kalyug. And just ask to the people who are supporting islam whatever that her/his ancestors belongs to which religion? Of course Hinduism. Islam is the best religion in the world! Jews were traditionally respected in Islam, alongside Christians, as people of the book (dhimmi). In the past decades however it has become increasingly difficult for minority groups to eke out an acceptable living in many Middle Eastern countries. Since Islam traditionally protected these minorities, it is clear this is not about Islam, whatever the excuse may be that is used to persecute people. Devotion to God (Allah) is the main virtue in Islam. Islam was a major force in uniting the Middle East and developing science and philosophy. It’s place in history is not all good, but certainly not all bad either. These days the Muslim world struggles, like in many ways we all do, with ‘modernity’. What to take from the ‘West’ and what to reject? Should women and men be treated equal? Muhammad made sure women in his time were treated better than they were before he came along. He married a wealthy independent woman, a strong first wife. However, the rules he set up look pretty weak in the face of the full equality women are granted in many western countries today. The question Muslims have to ask and answer is: Did Muhammad mean to leave women dependent on men, or did he want them to have more power and safety than they did before? And what does that mean for women and girls today? Islam is not just a religion its a way of life, it is the key to EVERYTHING in life.. Politics, sociology, psychology, science, history, nutrition, legal laws. Everything. Like fundamentalists everywhere, Muslim fundamentalists are using modern media to spread a conservative message. They would like to do away with the ancient techniques for interpreting the Quran and put a literalistic interpretation in it’s place. That means issues of language interpretation and context are not going to be included in the interpretation of Islam. Ironically this is partly a democratization: after all, interpreting an ancient text through the eyes of scholarship requires schooling. If you are only going to look at the most literal meaning of a text, you do not need any help. Anybody can do it. Sound familiar? It should. It’s the same thing Christianity has gone through. After all, who needs to learn Latin, Greek or Hebrew if you can pick up a translation of the Bible in any bookstore? And who needs a reverend to help interpret it if you can read yourself? For Christians this process started in the reformation, which was centuries ago. Muslims have only just started on this path. Perhaps more energy should be put into making sure the Muslim intelligentsia have the means to interpret Islam in context? I’m not saying extremism should not be fought, in whatever form it comes, but a bit of patience is also in order I think. Am I right, should Muslims be given more time to adapt? Should we be patient with Islam, or should all Muslims be treated as pariah’s, whether they’re personally supporting terrorism or not? Is Islam just plain bad? 28% Yes, Islam is bad and Muslims should just convert to something else. 72% No, Muslims should be treated on their individual merits, like everybody else. 581 people voted in this poll. Assalamu alaikum (peace be upon you). Why would you even bother about people’s opinion! People are driven by emotions more than anything else. It’s even better to pick up Quran and read it yourself and you will find the true answer. Everybody has the right to be informed before taking their life choice. This is my piece of advice to you all, give yourself the chance to KNOW first. Not through gossips but through evidence and don’t worry about versions because the Quran has only one version. Islam is the fastest growing religion in the WORLD! So, you be the judge of the best religion! There is only ONE GOD, and thou shall not worship no other! Islam has been the door for so many to a new clean life. It teaches to keep clean, physically and spiritually. Every day before praying, five times a day a Muslim must clean themselves. They must not smoke, drink alcohol, or tattoo themselves. This all leads to an unhealthy life. If you are wondering tattoos are in fact unhealthy. Muslims are not to eat pork due to it being a dirty, fatty, and unhealthy animal. It teaches to be peaceful to one another. It teaches to not fight with others and instead resolve the conflict peacefully. Islam teaches to respect one another. It teaches to not use fowl language or speak of a person behind their back. It teaches to care for family, friends, neighbors, and even those who dislike you. In Islam the greeting most commonly used is Assalamualaikum, meaning peace be upon you. The response to it is Wallaikum Assalam, meaning peace be upon you to. As a practicing Muslim, I find myself unable to impose upon others that my religion is better or superior to any other religion. But its a humble request that in this age of independent media, when we can’t be sure of reliability of any info presented to us, kindly spare some time and energy to explore Islam yourself….before you draw any negative conclusions 🙂 . And the best way to know more about Islam is to just give a read to an AUTHENTIC translation of Holy Quran. May we all be led to the straight path (Ameen)!!! Judaism is the best religion in the World! It’s tradition to call Judaism a world religion, perhaps because Jews are present all over the world. Strangely enough though Judaism is really an ethnic religion. Traditionally faith is not essential either, it is the Jewish practices that define a Jew, along with his or her decent. Whether a Jew believe in God is not relevant to their being a Jew, it’s whether their mother was a Jew that matters. This makes Israel the one country on earth where ethnicity is the main characteristic of citizenship. The Palestine people living in and near it’s borders are second class citizens precisely because they were not born Jews. Everybody created equal in the sight of God? Should the ideal religion be an emancipating force? In other words: do you think that all human beings are created equal in the sight of God, and should therefore have the same rights? I asked my readers: are we all created equal in the sight of the Divine? Buddha says there is no direction in sky its we,our mind creates all conflicts and starts building boundary around us with our narrow thoughts. Fact is we all are equal as we use same water, land, air etc. Stop terrorism in the name of religion,no religion tells to create terror in others heart/mind. Yes, we are all equal no matter what our religion or beliefs, I let the person’s actions not their beliefs tell me whether or not they are a good person. And what is this about karma creating differences? I believe in karma, meaning that we get consequences, good or bad, according to our actions in this and past lives. But Karma does not meant that we are not all equal in the eyes of God. Yes, just like religions such as Islam and Sikhism say, we are. God does not understand the concept of rank, but instead judges us by our soul. No I do not agree that Buddhism is the best religion. It is just as sexist and controlling as Christianity and Islam and Hinduism. I don’t like Buddhism because it has a male leadership and it treats women just as badly as the Christians do – in all the mainstream religions women are treated as second class citizens. That is not a religion – that is just a means to allow men to abuse and control their women and children. Sikhism is the best religion on earth! All religions are good and goal of all religions is same, but Sikhism is the only religion which provide free food, shelter and respect around the clock to every human without comparing his caste or religion ,it is the religion which i think stands near by humanity. We welcome everyone with open hearts. I think the discussion about which is the best religion or which is not, is as if we are discussing about differentiating between visible colors, or as if sweetness of fruit is being discussed. One thing is sure, the sensible one understands what is what? 5) for day to day life what guidance the religion provides. 6) review system and mechanism of assessment. 7) how the religion prepares its followers to strive for the betterment of society. The religions are all like professors in the same collage trying to educate and civilize man kind, and God is the dean. God is too big for any religion. I doubt any religion ever says their religion is the best. It is the PEOPLE of a religion that say their religion is the best. Now, God sent all his messengers to help us believe. Unfortunately, religion is where humans are separated. So we should keep our opinions to ourselves unless you want an ugly debate. We are all ignorant for even having to choose which religion is the “best.” All you have to do is except each others religions and stop arrogantly assuming your religion is the best because god doesn’t like if a person has an ego. Just know what is right from wrong it’s not that hard and do good and meditate you will be fine. But maybe we should start with getting rid of the word equal when we talk about humans. As we are not god we are not equal in each others eyes. But we all are of equal value, because we bring ourselves and every one of us has something of value to give. And only those who receive what we give can know what our value is to them. So it is of no use to talk about equal, as none of us is equal. But that does not mean we should not try to act humane towards ourselves and others and be the best human being we can be. Almost all the religions are same… So why we try find the best??? Do we really need to find the best religion or to have the best freedom, peace to our owns??? Buddhism is not a religion. Its a path that Lord Buddha discovered by himself and showed us to realise by our own. Try to just walk a little distance on that way and feel the difference. May all you can find the realism. I agree with u that humanity comes first and live beyond any religions! Anyone that has stated that there religion is the best should be ashamed because its an act of EGO thinking your better then others. That’s what my religion states Sikhism. Stay low and humble and do selfless service while chanting on the lords name. All humans have the right to be treated humane. So maybe it is time we started to teach ourselves and learn what it is to be human towards ourselves and others. I don’t think this is a question that can really be answered. If you are going to do something religiously it should be learning. Spirituality is a personal journey I think best pursued outside the confines of religion and religious dogma. To categorize each religion as good, better, and best is not something that I’m comfortable doing. I know what my faith is and love my religion to the core of my being. I am happy for others who find religion and have peace in their lives because of it, no matter which religion it is. Besides,God is merely a word, is it not? The word is not the thing. You’re worshiping the word, not God. One must drop their concept…might I add childish concept of God, then one sees Him. I’m not aware of any religion that doesn’t have at least a little blood on its hands. Don’t think there is a “best” one. Suggest reading “God Is Not Great: How Religion Poisons Everything” (2007) a critique of religion by author and journalist Christopher Hitchens. It’s quite the book. In my view the ideal religion is that the world is in a state that we don’t need religion. In Christian terms, Adam and Eve didn’t have a religion, they were just God’s children and could communicate directly with the Divine (until they Fell, got kicked out of the Garden of Eden, and needed religion to connected to God). That’s how humankind should be – living in harmony and peace together with God and all creation. No need for religion, rituals, doctrinal squabbles. Just human beings true to themselves, living happily in this world and the next. I would have to say Sikhism because it is the only religion that says that anyone can be close to God [regardless of their religion!] if they do good deeds for all. That is the reason why it hasn’t spread like others because it creates very little hate for others. Nevermind other religions but even constitutions have not caught up to the fairness Sikhism provides for all. Only thing that comes close to it is UN Charter. A good open-minded post that is both fair and informative. The expression ‘best religion’ however, is inappropriate. It should be which is the truthful religion. And it can’t be said that all religions are good because they lead to God, because many religions actually deter people away from God, e.g idolaters. 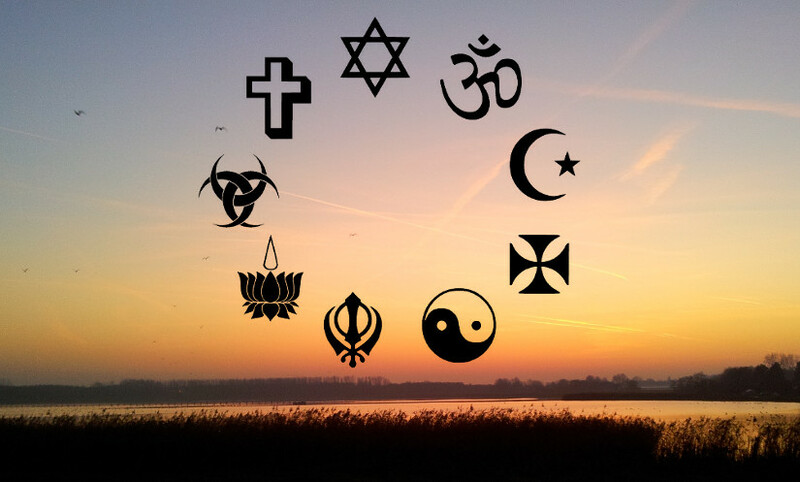 Moreover, many religions negate that the other religions are valid. From that perspective, I found that Islam is the most sensible, complete and practical religion; people can assess that for themselves if they read the Quran. Or contact me for a free copy. Best thing is to search by yourself if your religion is right as you like your religion due to your parents only. All your life you have seen your close family members practicing your religion hence your mind only think this is right. Previous Previous post: Different religions and different people speak of “their” God as the only God. Isn’t God one and the same for all? Next Next post: Mixing religion and politics?